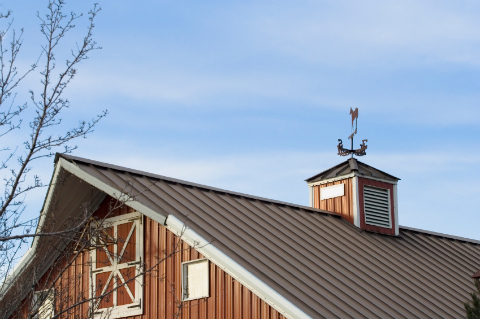 Metal roofing is very durable, and is not liable to leakage. However, in the chance that you need to perform metal roof repair on your home, here are some tips. A roof is a very dangerous place to be, and metal roofing is especially so. If you are going to perform a metal roof repair, wear rubber-soled shoes as metal roofing can be quite slippery. It is best to use a harness in the event that you fall off of your roof. Wear thick leather gloves, as a metal roof can be very sharp, and eye protection in case a piece of metal snips off as you are creating a patch. Conduct an evaluation of your metal roof before walking on it. If you have a hole in your metal roof, it could indicate deterioration of the roof decking (another reason to wear a harness.) If you notice any signs of structural damage, contact a metal roof repair expert straight away. It is very unlikely that you will get a hole in your metal roof, unless it has been very poorly maintained or installed. If you are experiencing a leak in your metal roof, it is likely coming from screws or nails that have worked themselves loose. Tighten these. You can also reinforce the screws with high-quality seam sealing caulk. If the source of the leak is not coming from the screws, then can use a water hose to isolate it. Run water very gently just under where you see water coming in, and work your way up. This can take some time. Again, be very careful as wet metal roofing is very slick. Once you find the source of the leak, you are ready to perform a metal roof repair. Keep in mind the purpose of your roof (assuming you have crimped panels, not standing seam), wherein the channels are designed to allow water to flow off. Do not gum up your metal roof with tar, as this will prevent water from flowing off properly. Use a high-quality seam sealing caulk to fill in any cracks in between panels. Evaluate all flashing on your metal roofing. If you see any holes or cracks here, use caulk to seal them. If the leak is not from these cracks but from an actual hole, you can adhere a metal roof patch. Using the same style of metal roofing, trim a patch six inches larger than the hole. Apply a base coat of metal roofing adhesive on the underside of the patch and adhere it to your roof. Use caulk around the edges of the patch to ensure no water can get inside. After everything is dry, use the hose test to see if your metal roof repair stuck. It is important to make sure you perform the job correctly as not to void your warranty or any possible insurance claims that may come from unexpected damage. Follow the manufacturer’s instructions for metal roof repair to the letter, or better yet, contract a professional metal roof repair man. They can ensure the job is done correctly, and will usually provide a guarantee of their own.